The Audio File Editor contains the following elements. Waveform overview: Shows a miniature view of the entire audio waveform. Click different parts to focus them in the waveform display underneath. Waveform display: Shows a detailed view of the waveform area selected in the waveform overview. 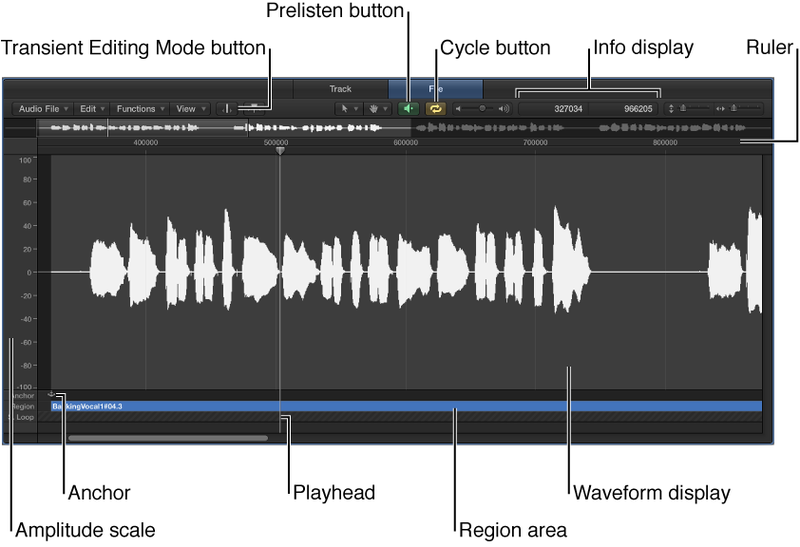 Transient Editing Mode button: Analyzes the audio file for transient events, and marks them. You can increase or decrease the number of events detected using the +/– buttons. Catch Playhead button: Reflects the current playback position. Tool menus: Choose two tools from the pop-up menus. The second (alternate) tool is chosen with the Option key. Play button: Starts and stops playback of the selected file, region, or loop. Cycle button: Loops playback of the selected area. Zoom sliders: Drag to adjust the vertical and horizontal zoom level. Info display: Shows the start point and length of the selected area. Ruler: Shows the position of the region in the project. If you have not yet added the audio file to your song, the position marker lines are dotted, indicating no time connection exists. Region marker: Indicates the length of the region. Edit this beam to adjust the region length. Anchor: Indicates the absolute start point of the audio file. Amplitude scale: Indicates the amplitude of the audio waveform as a percentage or in sample units.